Old English language Movies that are classics and can be watched again and again, and be a good part of a DVD collection. This American drama film is directed by Edmund Goudling and is adapted from a the novel Menschen im Hotel by Vicki Baum. 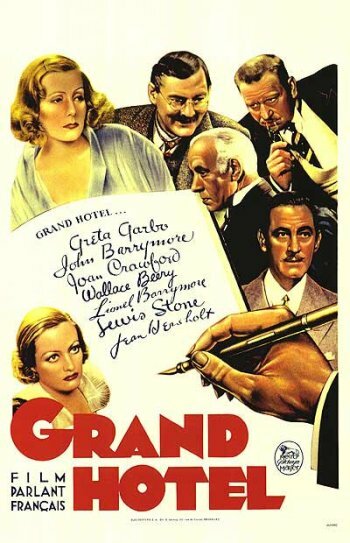 This movie stars Greta Garbo, Joan Crawford, Lionel Barrymore and John Barrymore. This movie opens with Doctor Otternschlag, a disfigured veteran who stays permanently at the Grand Hotel remarking “Grand Hotel....People come and go. Nothing ever happens”. After this seemingly innocuous remark, acts as a catalyst for a chain of events at the hotel. Baron Felix Von Geigern, a jewel thief and a master card player stays at the hotel undertaking small time theft and forgery. He is a noble man who has lost his fortune. The Baron befriend Otto Kringelein, a small time accountant who is fatally ill. He stays at The Grand to spend his last days in the lap of luxury. Kringelein's ex-boss is Director Preysing who is an wealthy industrialist staying at the Grand to ink a large deal. He hires a stenographer Flaemmchen who wants to be an actress. She shows Preysing her audacious photographs and hints that she is willing to do anything to be a star. Preysing soon starts an affair with her. Another guest, Grusinskaya is a famous ballet dancer who is tired of the world. She unexpectedly returns home and finds the Baron rummaging through her jewels. She says ”I want to be alone”, mistaking him to be a part of the staff. But the Baron stays and engages in a conversation which brings them both closer. After the conversation the guilty Baron returns her jewels and Grusinskaya invites him to accompany her to Vienna. The Baron agrees and engages to meet her at the train station. The Baron joins Flaemmchen and Kringelien for afternoon tea, where a coquettish Flaemmchen cajoles Kringelien to dance. Preysing who arrives is consumed with jealousy and imperiously tells Flaemmchen to stop. All are disgusted by his uncouth behavior and Kringelien gives him a piece of his mind. Preysing gets angry and the situation is diffused by the baron's intervention. The Baron tries to steal from the intoxicated Kringelien, but seeing his pathetic condition returns his wallet back. He turns his attention to Preysing instead. But as fate would have it the baron is caught by Preysing stealing his papers and in the scuffle bludgeons him to death. Flaemmchen arrives at the scene and runs to Kringelien who confronts Preysing. They summon the police and Preysing is summarily arrested. Oblivious of the Baron's fate, Grunskaya waits at the train station for him and grieves when the Baron does not arrive. Flaemmchen and Kringelien leave for Paris to try a new cure and vow to be be with each other. As they leave the hotel, Doctor Otternschlag once again observes, "Grand Hotel. People come and go. Nothing ever happens.". This movie may be a tedious watch for many as there are lot of a interconnecting events with no story to hold your attention. Btu it is critically acclaimed movie. The film is the only motion picture to have won the Academy Award for Best Picture, with that category being the sole category in which it was nominated. In 2007, Grand Hotel was selected for preservation in the United States National Film Registry by the Library of Congress for being "culturally, historically, or aesthetically significant." Another cause for its fame is Garbo's famous opening line “I want to be Alone” which is often alluded to her in real life. Garbo's reclusive nature fueled speculations that these lines were actually spoken by her in real life.